According to the display at the Visitor Center, this park, among the smallest in the Park system at 15,000 acres, has 1,419 species of plants. The only parks with more species of plants than the Indiana Dunes are the Great Smoky Mountains (1,581), North Cascades (1,567) and the Grand Canyon (1,474), all with over a half a million acres each. Yellowstone, with two and a quarter million acres, is home to 1,102 different species of plant life. While most of the park lies just across the County Line to the east of Miller, a corridor with hiking paths cuts west across Miller to the Paul Douglas Environmental Center on Lake Street, where there are displays and educational materials about the ecology and environment of the Dunes wetlands. The Visitor Center off of Highway 12 in Porter County has many maps and directions to beaches, as well as other information about the park. National Park System - Indiana Dunes National Lakeshore. assisting with environmental education programs for children and adults. The Save the Dunes Council has an extensive site on the Indiana Dunes and ecological matters. The University of California at Davis maintains a database of species, plant and animal, in the National Parks. An incredible database, it can be accessed at Species in Parks Flora and Fauna Database. Scroll down to find Indiana Dunes, or whatever park you want! 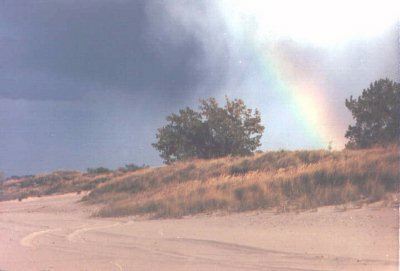 Photo above of the dunes and the rainbow is courtesy of W. James Spicer and is copy written. Use with permission of the photographer only.